It is not an overstatement to say that I am intoxicated by the full access to the Chinese Historic Newspapers collection that I gained today on ProQuest. So much power! So much information! Now all is needed is a research question. 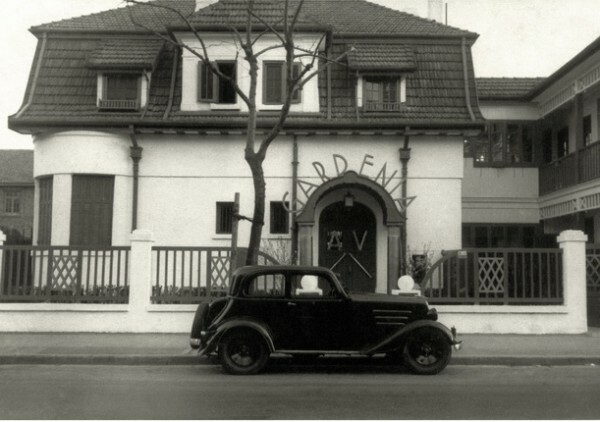 Here is a little article on Gardenia, Alexandr Vertinsky's short-lived cabaret on Yu Yuen Road revealing that the club's interior design was inspired by a nautical theme. A big thrill indeed is a trip on the S.S. Gardenia Gardens, what with delighful breezes, syncopating rhythms, good drinks, and fascinating fellow voyagers. Best of all though is the fact that you'll never get seasick; for the S.S. Gardenia Gardens is "safely anchored" at 1385 Yu Yuen Road, just a stone's throw, or rather, a "stern line's heave" from Jessfield Park. Smartly decorated to give the illusion of a huge ship, the Gardens boasts of a bow, masts, superstructure, life boats, dancing decks and a right jolly crew of waiters, musicians, bar girls and hostesses, all accoutred in the very latest nautical rig. Under the personal management of that well-known connoisseur and man of the world A. Arbatsky, the Gardenia Gardens offer a delightful refuge to the warm, weary and worried Shanghailanders. Peter Nicholitz and his five-piece band offer tuneful, dance-compelling rhythms with Walter Downing singing guitarists, late of the Cathay Towers wowing the cash customers with his songs, mostly about Hawaii, which is Walt's "I wanna go back to my little grass shack," i.e. home. The Gardenia Gardens are owned by that famous singer, Alexandre Vertinsky, one of Shanghai's best loved artists. Follow the tags for Gardenia or Vertinsky to read more.